Sai Baba’s life on thread – battles over his wealth? I have predicted that – as Sai officialdom always does – the facts have been glossed over by Dr. Safaya and all the other believers in Sai Baba’s omnipotent powers. 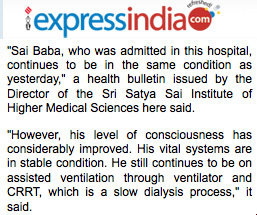 Sai Baba’s condition has been critical and doctors have had to ‘fight to save his life’. That he is on continuous kidney dialysis is a telling sign that his system is not likely to enable him to survive long. Malnutrition in old age is usually connected to mental degeneration or old age depression, signs of both of which have been visible in him since his 85th birthday celebrations where he appeared as an unmoving almost wooden idol. Whether they are successful or not time will show, but it is a sign, perhaps, in that the vultures are gathering already: his nephew Ratnakara (TIMES OF INDIA) is reportedly trying to take control of the Sathya Sai Central Trust and even to ‘step into Sai Baba’s shoes’! The Sathya Sai Central Trust has also reportedly obtained signatures from at least two of Sai Baba’s relatives (Deccan Chronicle).. A recent report from various Sai ‘authorities’ is that Sai Baba’s condition has stabilized again and that he is showing sings of some improvement. One must evaluate this on the background of the turmoil surrounding the doctors and officials who have even been attacked by suspicious and fanatical devotees trying forcibly to get immediate access to Sai Baba (who is in intensive care still on a respirator and continuous dialysis!). Signs of a degenerate old aged depressed ill person? Comment: Such devotees believe him to be totally omnipotent and to be taking on the cosmic karma of all humanity! The indoctrinated sheer unreasonablity of it all alone ‘boggles the mind’. On April 2nd, an interesting event was reported by the Deccan Chronicle:- Meanwhile, tension prevailed at the hospital on Saturday as Satya Sai Baba’s relatives argued with doctors after they were denied permission to visit him. The doctors told the relatives that phlegm had accumulated in Baba’s lungs need to be removed as he was unable to spit it out. But the relatives turned suspicious about Baba’s health and argued that they be allowed to see him. They wondered why they should sign the papers when the Baba was said to be safe. Sai Baba's "level of consciousness" improved? One can but laugh - he who has ever boasted he is ever totally superconscious! Not in any known dimension! April 5th 2.40am. “Government-appointed Dr Ravi Raj earlier allayed fears of Sai Baba’s devotees from India and abroad saying his health was improving and there is no immediate threat to his life. His blood pressure was said to be normal but urea count in urine was high necessitating dialysis. COMMENT: This is of course in direct contradiction to all the bulletins – of the ‘critical condition’ and ‘doctors fighting to save his life’ – issued in the previous 12 hours. One wonders if wishful thinking is so contagious that Government doctors catch it! From fiction into fact Many of the unconfirmable and uncontrollable rumours are an important part of the basis of belief for many devotees I have met through two decades. The Sai movement thrives and expands on the basis of rumours about Sathya Sai Baba, his doings in the flesh and in the spirit, every fresh bit of hearsay is eagerly awaited in the Sai movement and is devoured whole – hair and all – with unquestioning acceptance and uncritical servility. One can already begin to speculate on what will be concocted as his ‘famous last words’ or as a parting deathbed miracle by those around him who have spread false stories and rumours on a massive scale (like people walking through walls from the interview room direct to Australia and another to Mecca!). So be prepared for unreason and deceit to break lose yet again! Though all his official believe fully he was once Rama and Krishna etc., it is unlikely that such final miracles as a golden chariot descending from the heavens to pick him up will be observed, but one never knows with so many gullible religious devotees and uneducated peasants (note: most Hindu believers credit the myths of the Ramayana and Mahabharata and Srimad Bhagavatam as gospel truth). Comments from Indians showing the absurdity of the whole Sathya Sai Baba cult and his claims a re being posted as never before on various Indian news sites. One hopes that this will be the beginning of a most necessary sea change in religious superstition in India.. though there is probably further to go there than in any other country on earth.